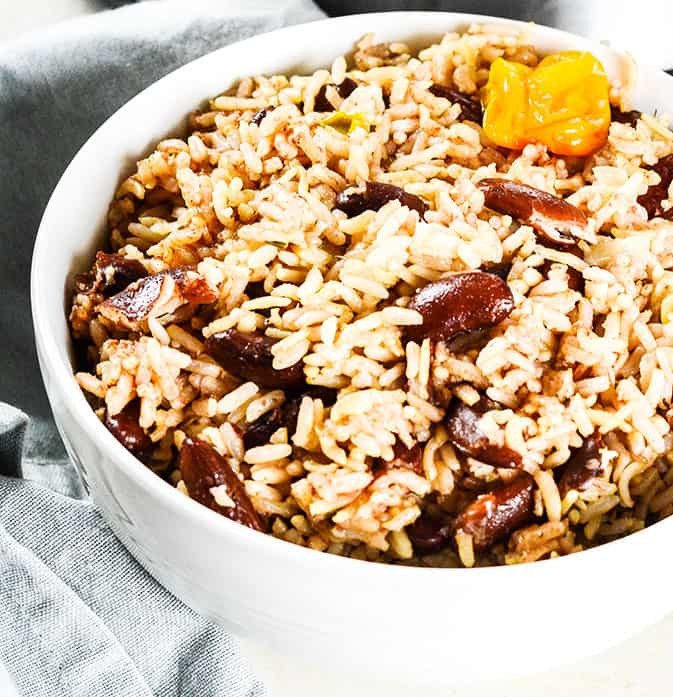 Prepare your JAMAICAN RICE AND PEAS using your Instant Pot for perfect rice every time, you can literally walk away and return with authentic INSTANT POT JAMAICAN RICE AND PEAS! My husband recently bought me an Instant Pot and it is a huge game changer for me! It has cut down my preparation time and I have the peace of mind that I can walk away from the pot and don't have to worry that I'm going to ruin my dish. I was wondering what was the big deal about Instant Pot and now that I have one, I'm wondering why was I second guessing! It reminds me of having a smartphone, I'm wondering how I survived without one! 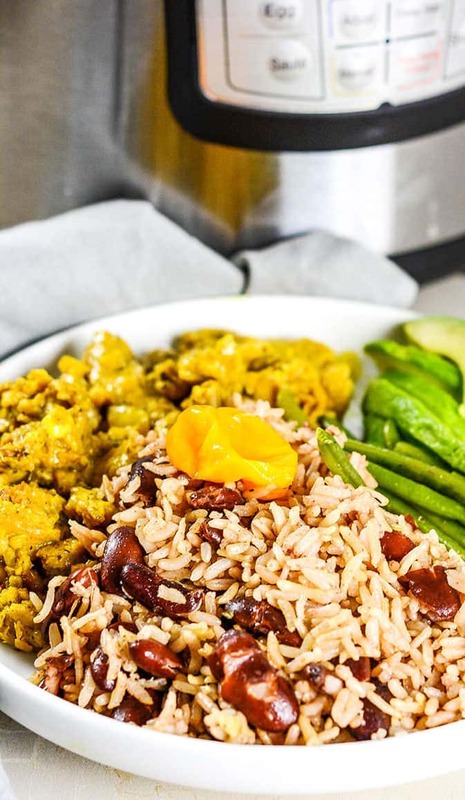 For those who haven't take the plunge in purchasing one, you can still make the recipe the traditional way with this Jamaican Rice And Peas Recipe. It is delicious served with my Jamaican Jerked Cauliflower recipe. The recipe is so easy, I presoaked the beans overnight after sorting them and washing them in a colander. The next morning, I drained the beans, rinsed them and put them in my Instant Pot with water and pressure cook them for 8 minutes on high pressure using the manual setting. After the 8 minutes has finished, allow steam pressure to naturally release for about 20 minutes, you leave the valve closed and allow the pressure to decrease naturally. I have also used the quick release method, by opening the valve, turning it from sealing to venting and allowing the steam to release quickly. When the Instant Pot is depressurized, the float valve will drop and the lid will be able to unlock to open. Until the pressure is released and the float valve dropped, the pressure cooker will not open. Next, I added all the remaining ingredients to the Instant Pot and set it manually to cook for 22 minutes. Back home in Jamaica, we refer to kidney beans as peas, hence the name. Traditionally rice and peas recipe is eaten every Sunday for dinner, using dried kidney beans that are soaked the night before and freshly squeezed coconut milk. Thyme, the herb of choice, and scotch bonnet pepper are added to the pot whole for flavor. Be careful not to open the pepper, because it is extremely hot. 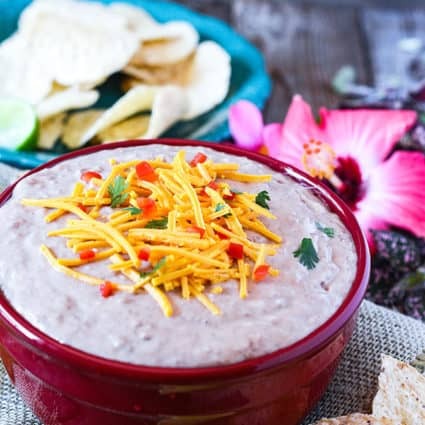 Place kidney beans in a large bowl and cover with water, making sure that there is enough water for the kidney beans to double in size (about 2 inches above beans). Let the beans soak for at least 6 hours or overnight. Drain beans after soaking and rinse using a colander. Place kidney beans in the Instant Pot and add 3 cups of water, cover instant pot securely and make sure to turn the valve to 'sealed' position. Manually set Instant Pot to cook beans for 8 minutes at high pressure. When the timer goes off, use the natural release method, do not open the valve and allow the pressure to release naturally. Meanwhile, sort and wash rice, using a fine mesh strainer and set aside. Remove lid, add onion, green onion, garlic, ginger, coconut milk, rice. Stir to fully incorporate rice with all the other ingredients. Add allspice, thyme, salt and stir again. Add Scotch bonnet pepper or cayenne pepper. When the timer goes off, allow steam pressure to naturally release for about 20 minutes, turn the sealing knob to venting to release the remaining pressure. Remove lid and discard Scotch bonnet pepper, fluff rice and its ready to serve. Uuugh. I don’t know what I did wrong!!! I follow the recipe to a tee and my rice came out mushy. Not fluffy as pictured. Do you think I should of used 2 cups of water instead of 3? Or do you think it’s because I’m using a Pressure Cooker XL instead of an Instant Pot? Deanna, did you use brown rice? I made this since I got a new IP and needed an accompaniment for my jerk chicken. I was so happy to see this and the only thing I didn’t do is soak the peas because I was in a hurry. I cooked them according to IP instructions with 2 T of ACV to kill any chance of gas. I followed everything else as you wrote and this turned out wonderfully. I hope you have more Jamaican recipes with IP. Wow that’s wonderful to know that it turned out great even without you soaking the peas. I haven’t tried ACV to kill gas thanks for sharing, my husband is so sensitive that I might not have a problem risking cooking unsoaked beans but he does, lol. I do have Instant Pot Stew Peas and Jackfruit with Potato Curry that you can try. What IP instructions did you use? I have not been able to find any even on their website. Charlotte, this is what I copied and pasted from the instructions, “Close lid securely, turn the valve to the sealed position. Manually set Instant Pot to cook rice and peas for 22 minutes at high pressure. When the timer goes off, allow steam pressure to naturally release for about 20 minutes, turn the sealing knob to venting to release the remaining pressure. Remove lid and discard Scotch bonnet pepper, fluff rice and its ready to serve.” Note, I used brown rice. I was wondering if Rice and Peas could be made via the IP and was very pleased to find your recipe. We tried it today with the dried red peas and it came out beautifully. Wow that’s awesome, so happy it turned out great and thank you for your feedback. Tried this recipe yesterday and it came out perfect! Used canned kidney beans and 3 cups water along with coconut milk. Thank you this recipe is a keeper, I could never get the right consistency on the stove top. Husband also gave compliments and he is a tough critic. Christinea, I’m so happy it turned out great for you and even your hubby enjoyed it. Thank you for sharing your feedback and I hope you also try the Instant pot Jamaican Stew Peas. One of the advantages of using an instant pot is that you do not have to soak the peas. You would just leave them in longer. Why are you still soaking and how long would you recommend to pressure cook if one chooses not to soak? I soak most of the time because it digests better, I’m talking from personal experience and my husband knows hours later when I haven’t soaked the beans. 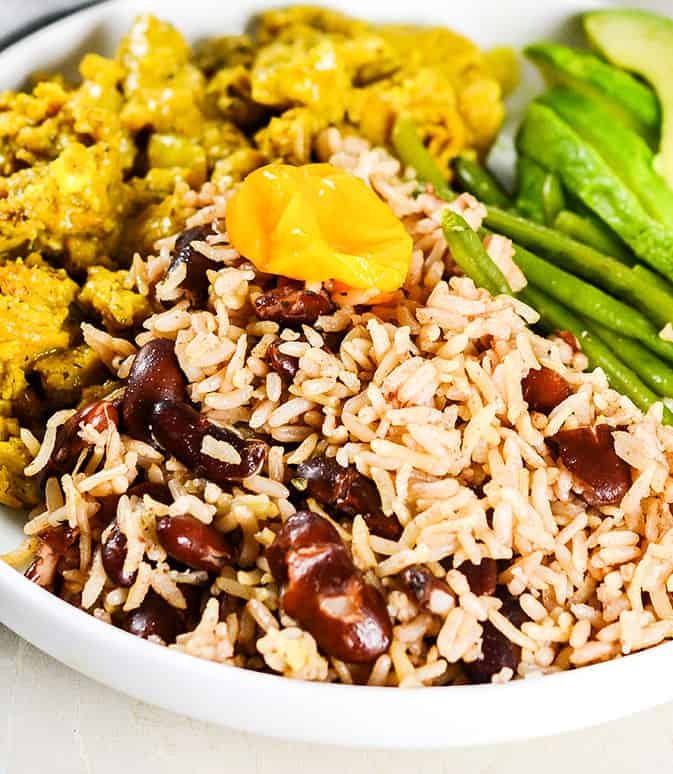 Unfortunately, I do not know how to make this with uncooked kidney beans and will only be guessing, we Jamaicans dislike soggy rice and peas or undercooked rice so if you try please let us know. In the comments below you give two different instructions for using canned beans. In one comment you say to use 3 cups of water, and in the other you say to use 1.5 cups of water. Please clarify! I can’t find where I said 1.5 cups of water. Let me find it in order to clarify. All I am seeing is 3 cups of water for both dried kidney beans or canned beans. Oh wow Zach, you would think that halving the recipe would work but from what you are saying it didn’t. Well, I only tried it once with the original recipe that has double the amount and it came out perfect. Unfortunately, I would have to experiment with it for half the recipe and time won’t allow me just now. I would recommend if you love the recipe then make it as is and freeze the leftovers in portion sizes and it will keep in the freezer for about 6 months. I have a lot in my freezer right now. I think I might have halved wrong, I think I put too much water in it the last time. If I half the recipe do I cook the full time? If using canned beans, to what time should I set the instant pot? Jaydee, you would cook it for 22 minutes on high pressure if using brown rice. Hi. If I’m using canned beans and do not need to do steps 1-3 do I still need the 3 cups of water to cook the rice? Marquise, 1 1/2 cups water plus the coconut milk should be enough liquid for 3 cups of rice. So if using canned its 1.5 cups water or 3? 2 cans of kidney beans plus 3 cups water and 3 cups rice. Awesome Charlene, thank you for your feedback. So excited that it turned out well for you. I’m definitely planning to add more. Someone asked about the yellow food and you said pepper, but not what’s on top of the rice but next to it… it looks delicious (not the pepper!). Would love it if you shared it with us ?. What model instant pot do you recommend? Patrick, I have the 6 quarts 6 in 1 for a family of 3 and we got my daughter the 3 quarts for university. 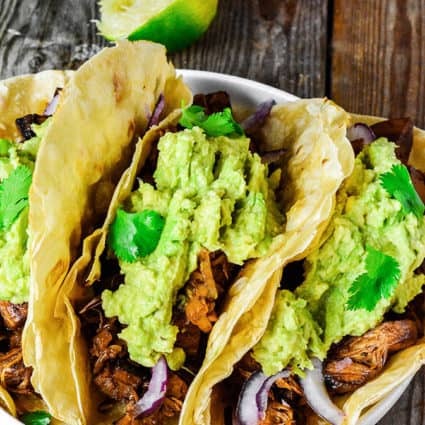 I tried this recipe in my instant pot today for Sunday dinner. PPPPPUUUUUURRRRRFFFFECCTION!!!! I use white rice with a little less water and it was amazing! Truth be told I always struggled with getting stove top rice and peas to be just right but this one was PERFECT! Thank you!!!!! Alicia, that’s wonderful so happy it came out perfect with white rice. So excited, thank you for your feedback! Now i need to check out your other recipes!!!!! How much water did you use for the white rice version? Ross I didn’t experiment with white rice but what I would do is use 1 cup of water plus 2 cups of coconut milk, 3 cups of white rice plus the remaining ingredients, set on manual pressure for 12 minutes. Hopefully, this works. You are welcome Ross, thank you for your feedback sounds great! I made this tonight and the rice is too sticky and clumpy. I used canned beans that I drained and followed the instructions exactly. Do you know what could have happened? ? I also made your lentil soup and it was delicious!!! Dulce, it shouldn’t be clumpy at all. I have made it numerous times if anything I would expect that it would turn out too dry. Let’s troubleshoot and see, did you use a long grain brown rice, the recipe is for brown rice because white rice cooks faster and would require less water. I like Jasmine brown rice or Basmati brown rice that is purchased from Trader Joes. If you used brown rice, the next thing I would say to use less liquid next time, no more than 1 inch and a half above the rice and beans. So happy the lentil soup turned out well, thank you for your feedback. Hi Michelle. Thank you for the recipe, I made it today and the main problem I have, is that I can’t stop eating the rice and pea’s. Thank you Angelique I’m so happy you are enjoy it, you have a good problem hahaha. I’m getting ready to make a batch for the weekend as well! What is the yellow food to the left? That looks yummy to! That must be pepper, it is optional, thank you! How much peas should be listed in this recipe? Looks delicious! Hello Michele, thank you. In Jamaica what you call beans is referred to as peas hence the confusion. I explained that in the introduction. Do you still use 3 cups of water if you’re using canned beans? Yes, I drained the can beans first and the water is also for cooking the rice. I made it! And it was delicious! Thank you Teresa for your feedback, I’m happy you loved it! Michelle, If you are using canned beans and they are already cooked shouldn’t you skip step 3 and move to step 4? I’m afraid that the beans might get too mushy if I cook the canned beans 8 more minutes and then do a natural release before moving to step 4. I’m so excited to taste this recipe! 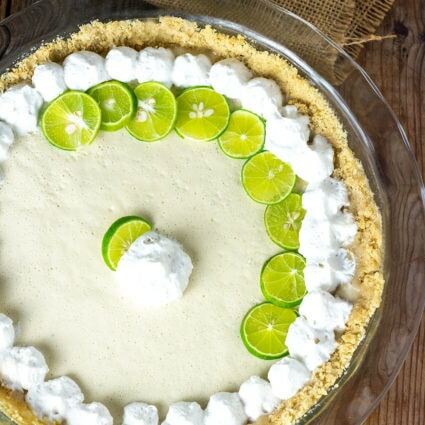 Michelle thznk you for catching that, that’s exactly what I meant, hope you enjoy my recipe! Hey, looks delicious, but I wonder how long does it take in regular pot? Thank you Shani, it will take from 50 minutes to an hour in a regular pot and only 22 minutes in the Instant Pot, note that the time is for brown rice.There is a link to the recipe for traditional stove top method above the recipe, in the story section. I am so happy you made the jump! Welcome to the Ipot family! I can’t wait for you to add IP conversions to your recipes. I did so for one of your curries and it was awesome and less time consuming. Can’t wait to try this one! Thank you Moalyne, I now want another pot so I can do the curry and the rice separate and keep them warm while I’m working and not have to reheat the dishes by the time my hubby gets home. Hello dear I’ve been using my rice cooker over the last 8 years to cook rice and peas.